If you mentally picture Minecraft as a Cubist Realm, then a Minecraft Gravity Feed Cube Dispenses Hangers point-of-purchase display won’t throw you off stride. These Minecraft Hangers are small enough to serve as key chain or purse charm danglers. And again, because small, can gravity feed for presentation and sale. But do read the fine print before purchase. 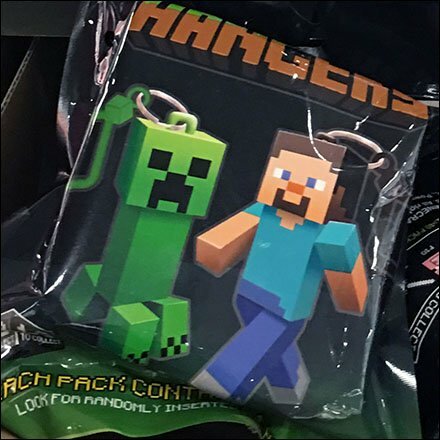 The display says Minecraft “Hangers Fun Pack” with the qualifier “Contains 1 Hanger” even though almost all visuals show them in pairs and groups. Consider the proposition as your take in the Minecraft Gravity Feed Cube Dispenses Hangers display via gallery of images. “Gravity-Feed in Retail Pinterest Board“ for a visual summary.